Where do I get new recycling boxes and bags? If you are a Maple Ridge resident, you can pick a new set of recycling boxes and bags at the Maple Ridge Recycling Depot, 10092 – 236th Street, order by phone – 604-463-5545 or fill out a form online. We deliver blue box and bags every Saturday or Sunday. If you’re not home, no worries – we’ll leave them near your front door! M y recycling wasn’t picked up on my regular day – who should I call? If your recycling was set out before 7:00 am and not picked up, please phone our office at 604-463-5545 and we will pick up your recycling either that day or the following day. PLEASE NOTE THAT WE DO NOT PICK UP RECYCLING ON STATUTORY HOLIDAYS – This includes New Year’s Day, Family Day, Good Friday, Easter Monday, Victoria Day, Canada Day, BC Day, Labour Day, Thanksgiving, Remembrance Day, Christmas Day, and Boxing Day. 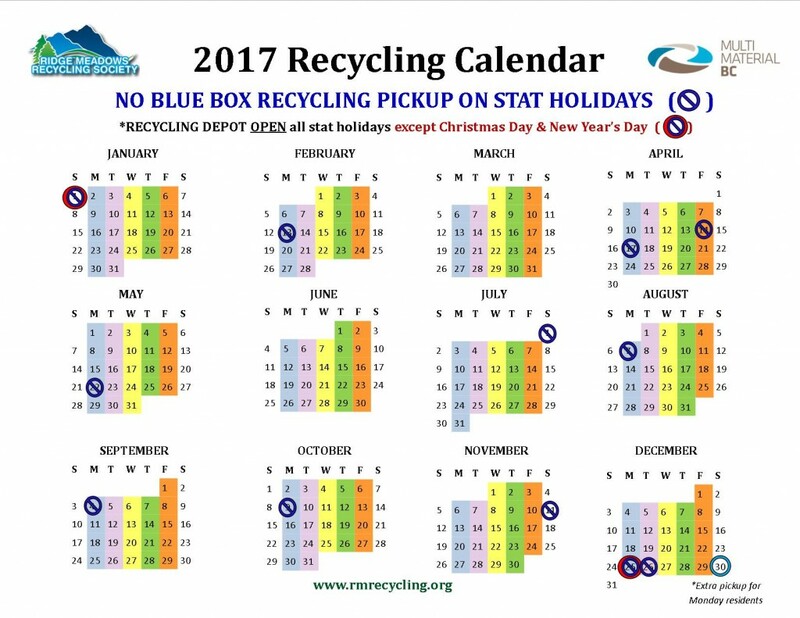 *If your recycling pick up day falls on a holiday, we will pick up your recycling on the next non-holiday week. What do I do with used paint and other hazardous substances? Unwanted paint, pesticides, and flammable liquids can be dropped off at the depot’s Household Hazardous Waste Drop-off site as part of an EPR Program. Community groups interested in used paint for projects can call us at 604-463-5545. Do you accept aerosol cans? Yes! Aerosol paint cans are accepted through an EPR Program at the Recycling Depot ONLY, but EMPTY household aerosol cans can be put into the Blue Cans & Cartons Box to be collected curbside. Do I need to wash and squash the plastics I put in my Red Box? Please wash and squash all your plastics. This will remove unwanted odors and pests during processing. Squashing the plastic also allows for more plastic to be loaded on the truck, and fewer trips back to the Depot to unload. This is when unacceptable material is placed in a recycling box or bag. For example, if someone puts window glass in the grey box with their glass bottles & jars. Window glass is a different type of glass and is not covered in RecycleBC’s printed paper & packaging stewardship program. It is considered a contaminant, resulting in an increase to the program cost and ultimately the cost to the taxpayer to have these materials removed and disposed of as garbage. Commingled means putting different recyclable items together in the wrong recycling box or bag. If there is too much commingled recycling in a 1 ton bale, it could result in that bale being disposed in a landfill. Currently less than 2% of all materials collected has to be disposed of that way. This is because of the care taken by Maple Ridge residents to sort their recycling properly. Do I need to remove the label from metal cans? Yes, please. Paper labels on metal cans are relatively easy to remove. If paper is included in the metal stream, it is considered a contaminant. The paper label can also be recycled in the yellow bag! The problem is that during the recycling process, the metal is melted at high temperatures, and if enough paper is present, flash fires can erupt in the furnace, endangering the workers and producing impurities in the end product. These impurities cause the metal to be downgraded, thereby reducing the revenue received for the material by the program. Do I need to remove the label from glass bottles? No, you do not need to remove the label from glass bottles. First, the labels are often very difficult to remove. Second, the process for recycling the glass bottles has developed to enable the label to be removed prior to the heating phase. The recycling process for glass bottles involves smashing the glass into particles and then screening the pieces. The screens remove metal and paper. Why can’t I recycle light bulbs, window panes and Pyrex with my glass? These glass products all have different physical properties and therefore different melting points, making it impossible to make glass bottles or other glass products from the recycled material without imperfections. Do I need to remove staples before recycling paper? It is preferable but not mandatory. During the paper recycling process, the pulp passes through numerous screens to remove staples and other contaminants (many of which are then recycled). You should definitely remove large metal fasteners from corrugated cardboard boxes, as well as bulldog and paper clips from files and papers. Can I recycle Styrofoam (polystyrene)? Not in your curbside recycling, but we accept it for free drop off at the Maple Ridge Recycling Depot. Styrofoam is a trade name for the material made from polystyrene. In order for this material to be recycled, it needs to be clean. Please clean any polystyrene used for take out food containers as it may be contaminated with food waste.